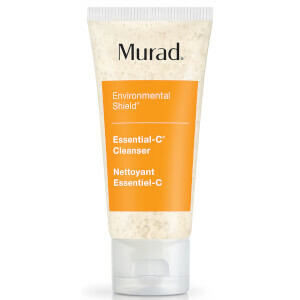 Murad's #1 acne cleanser with two types of salicylic acid is now available in a travel-friendly size! This powerful acne gel cleanser helps dissolve excess oil, purify pores, clear existing blemishes and prevent future breakouts. It is formulated with two types of salicylic acid: a free form that starts treating immediately and an encapsulated form that continues treating even after rinsing. Green tea extract helps soothe and calm irritation for healthier-looking skin. This product is formulated without gluten. This product is cruelty-free. 1. Massage a small amount over dampened face and neck. Rinse with warm water and pat dry. 2. Follow with a Murad Step 2 treatment. 3. For SPF protection during the day, follow with Oil-Control Mattifier SPF 15 | PA+++. At night, follow with Skin Perfecting Lotion. Inactive: Water (Aqua), Sodium C14-16 Olefin Sulfonate, Cocamidopropyl Betaine, Urea, Yeast Amino Acids, Trehalose, Inositol, Taurine, Betaine, Methyl Gluceth-20, PPG-26-Buteth-26, PEG-40 Hydrogenated Castor Oil, Butylene Glycol, Cimicifuga Racemosa Root Extract, Camellia Oleifera Leaf Extract, Silver Citrate, PEG-150 Distearate, Menthol, Zea Mays (Corn) Starch, Hydrolyzed Corn Starch, Hydrolyzed Corn Starch Octenylsuccinate, Glyceryl Stearate, Cocamidopropyl Dimethylamine, Polysorbate 80, Citric Acid, Disodium EDTA, Phenoxyethanol, Caprylyl Glycol, Chlorphenesin, Limonene, Citrus Reticulata (Tangerine) Leaf Oil, Cymbopogon Nardus (Citronella) Oil, Citrus Limon (Lemon) Peel Oil, Citrus Aurantifolia (Lime) Oil, Lavandula Hybrida Oil, Citrus Nobilis (Mandarin Orange) Peel Oil, Prunus Armeniaca (Apricot) Kernel Oil, Fragrance (Parfum).